“Alright sir, I’ll keep an eye on him. I shall simply tell him three simple things, that’s all. One, bide your time; two, keep your nose clean; and three, don’t let the bastards grind you down.” – Norman Stanley Fletcher. Monkey D. Luffy has come to learn that his brother, Portgas D. Ace, is being held prisoner in Impel Down, the chief prison used by the World Government, from which no-one escapes. Having originally planned to reunite his separated crew, Luffy instead decides to save Ace, for he is soon to be executed. Thus he is smuggled into the jail by Boa Hancock, one of the Warlords of the Sea, who decides to visit Ace herself to secretly let the big brother know of Luffy’s plan. 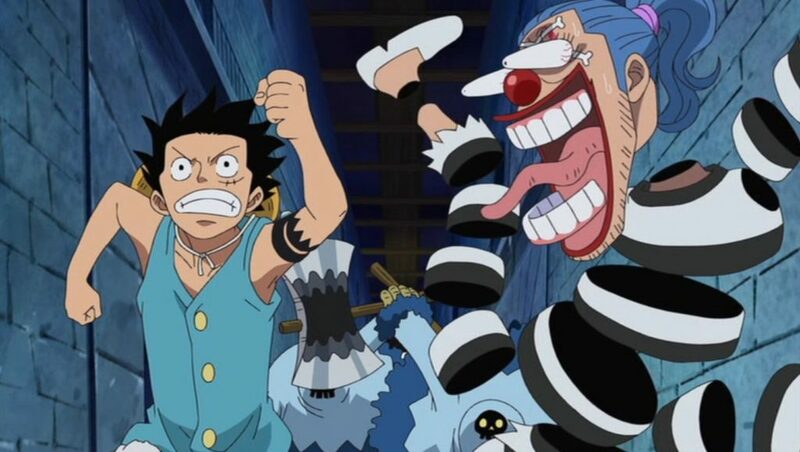 After Boa manages to smuggle Luffy into the jail, the rubbery pirate begins to make his way down the various undersea levels of the prison in order to save Ace, each level containing various tortures and a wide range of different inmates. This is where this collection makes a big difference to most of the series. Aside from four filler episodes, which are there to promote the One Piece movie Strong World, the rest of the Straw Hat pirates are totally absent from this collection of episodes. If you are wishing to follow the other crew members, you will be disappointed. However, what we do get is the return of several characters from past seasons – namely people who have been defeated by Luffy in the past and are now inmates in Impel Down. The first of these is Buggy the Clown, the pirate who can chop up and reassemble his own body, who has managed to escape from his cell and is planning on breaking out. However, he gets caught up with Luffy and ends up going down instead of up against his will. They then encounter several agents of Baroque Works: first Mr. 3, with his wax powers; then Bon Clay, who is on much more friendly terms with Luffy than the others. As the quartet make their way towards Ace, they eventually end up having to fight against the strongest members of staff inside Impel Down, in particular the boss, Warden Magellan, whose Venom-Venom Fruit powers mean his entire body is poisonous – a single touch of his body results in anyone becoming infected, making him incredibly strong, provided the poison doesn’t affect his diarrhoea too badly. Like the last collection of episodes, Collection 18 has its ups and downs, but not to the same extremes as Collection 17. The fact that four whole episodes are just there to plug a film rather than tell the story is deeply frustrating, and the lack of appearances from the rest of the crew is arguably an issue, and one that won’t go away for a while yet. However, on the plus side we get to meet some old characters that we haven’t seen in a while. The introduction of some new characters also provides much to discuss. One is Jimbel (depicted on the DVD cover), a whale shark fishman described as the “Honourable Pirate”, who is imprisoned in the same cell as Ace. He plays other major roles as the story of One Piece progresses. Another is Emporio Ivankov, aka Ivan (or Iva, two different spellings are used), a former prisoner who has created a safe haven inside Impel Down for other escapees. He is also described by Bon Clay as the “king of queers”, depicted as a Dr. Frank-N-Furter style transvestite, and ruler of the transvestite island Sanji ended up on, which I had several issues with (see Collection 17 review). However, Ivan is arguably a more positive character. Thanks to his Devil Fruit powers, which allow him to inject people with hormones, he can help people recover from their injuries and even change people’s genders, making people feel more comfortable with themselves. He himself can change his own gender to suit whatever fight he is in, so you can argue that he is genderfluid. I do feel that Ivan helps to make the depiction of homosexuality in One Piece a bit better. Regarding extras, there is your standard textless opening and closing, episode commentaries, and then two additional features with two of the English dub actors in the series. One is of Brina Palencia, the voice of Tony Tony Chopper, playing the game Operation; and the other is Eric Vale, voice of Sanji, doing some cooking. These two features do have at least one area of interest: they are the most you hear of these actors across the collection.